According to historian Bernard L. Herman, the main dwelling house represented only one element of the urban lot that defined the Charleston town house; the ensemble of buildings included “kitchen, washhouse, quarters, privies, stables, work yards, gardens, and a variety of other structures ranging from rickety garden sheds to two-story brick warehouses.” The organization and architecture of the various buildings on any given lot depended on its size, the characteristics of the main dwelling, the household economy, as well as the location within the city. However, regardless of size, the Charleston town house was--at a minimum--the product of two elements: the dwelling house and the kitchen house. Kitchens were constructed as separate structures to eliminate the impact of cooking smells and heat from the main dwelling. However, as historian Gene Waddell has pointed out, the original purpose of kitchen house was also residential. The first floor contained the kitchen and a “wash kitchen” for laundry; living quarters for slaves or servants were upstairs. 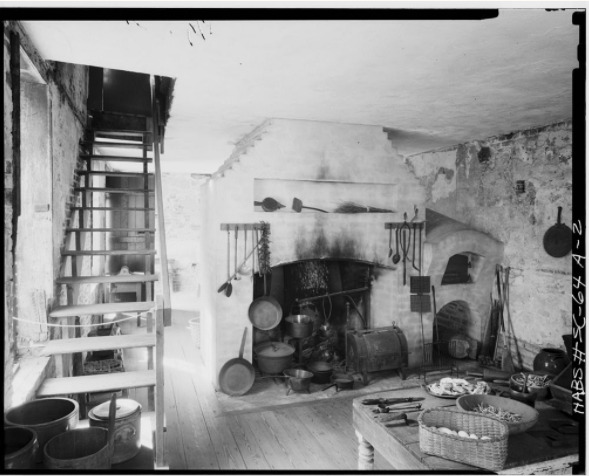 Kitchen houses were usually (but not always) constructed of brick-- regardless of the building material of the main dwelling--to reduce the risk of spreading fire. However, during periods of rapid growth, wood was used if it was readily available and brick masons were hard to come by. Charleston kitchen/wash houses with living quarters generally assumed one of two forms. In the 1700s, the most popular configuration incorporated a large central chimney with back-to-back fireplaces. One side was used for the kitchen, the other as a washhouse. The stairs to the living quarters were located either in the kitchen or in a small lobby between the rooms. The Heyward-Washington House, South of Broad, has a kitchen house with this design (see photo above). By the 1820s, a second kitchen house configuration gained favor. In this design, the central fireplace was eliminated and two fireplaces were installed against the rear wall of the building with separate chimney stacks. This configuration allowed space for a straight-run stair between the rooms leading up to the living quarters. A notable example of this configuration can be seen at the Aiken-Rhett House in Ansonborough. Have a peek at our own examples of these two types of kitchen houses; both have great stories and are available for purchase! 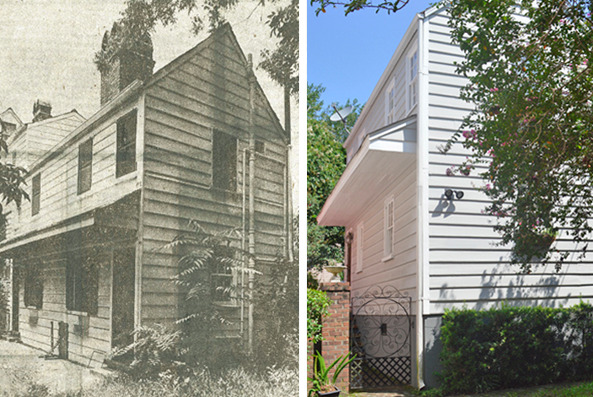 Granted, all houses in Charleston have an interesting past, but we really like this one. In the latter part of the 18th century, Charleston was growing rapidly and the city had expanded so greatly that the 1780 Revolutionary War fortification had to be placed just north of “Boundary Street” (now Calhoun Street). Wooden structures erected just inside the wall near St. Philip’s Glebe House (built circa 1770 for its ministers and now the College of Charleston’s President’s House) were still standing 200 years later when the city made plans to build a parking garage. The Preservation Society of Charleston’s newly hired executive director, Henry Cauthen, Jr., arrived just in time to save several buildings from demolition. Among these was the main dwelling and kitchen house at 34 St. Philip Street. The original owner, Mrs. G. Theodore Wichmann, bought back the kitchen house and moved it in 1974 to its current site at 76 Beaufain Street (the main dwelling was relocated to 2 Pitt Street) in Harleston Village. The massive central chimney with the two fireplaces was left intact and the structure has one of the few surviving “runs” or cantilevered porch roofs in Charleston. The kitchen house at 34 St. Philip St. before relocation in 1974 and as it stands today at 76 Beaufain Street. This historic gem is currently listed for sale with Ruthie Smythe. At the close of the War of 1812, a building boom hit Charleston and some of our most impressive mansions were built during this period. One such residence was the three-and-a-half story brick Charleston single house and outbuildings erected in 1816 at 301 East Bay Street. The home was built by Moses Levy, a prominent King Street merchant and staunch supporter of the synagogue Beth Elohim on Hasell Street; he was credited for saving its sacred scrolls during the Great Fire of 1838. Levy’s granddaughter, Phoebe Levy Pember, is considered a heroine of the Confederate cause and was included in those honored by the US Postal Service in a 1995 collection of stamps commemorating the Civil War. The “Florence Nightingale of the South,” Pember pioneered a role for women in wartime medicine as the first matron of a military hospital in the South--in what was reputedly the largest military hospital in the world. Her memoir, “A Southern Woman’s Memoir, Life in Confederate Richmond,” (1879) is considered a minor classic by Civil War historians. The home where she was born is now called the Phoebe Pember House. Both the main dwelling and its kitchen house (in the two-chimney style popular at the time), as well as the carriage house, have been beautifully restored. The kitchen house sits at 26 Society Street in Ansonborough and is available for showings with Lois Lane. Check out the video.